WILLIAMSVILLE – The Rock River Players’ Play Selection Committee (PSC) welcomes directors’ proposals for plays to round out its four-play 2016-2017 season. The PSC will be pleased to meet with anyone who would like to direct the Players at the Williamsville Hall, Dover Road, Williamsville, VT. Proposals will be welcomed Friday, September 9, from 7PM, and on Saturday, September 10, from11AM. Please call or email Charlie Tower at thirdgate@yahoo.com or 978-434-7958 to arrange a time to meet. 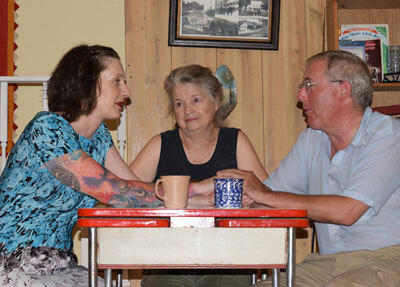 The Rock River Players’ season opens the last weekend of October with A Piece of My Heart, directed by Sara Vitale. The PSC will select remaining plays to complement that drama, to develop the season’s theme, to offer Players challenge and opportunity for growth, and to appeal to wide and varied audiences. Slots open are for May and August productions. The Rock River Players’ PSC aims to offer opportunities for the participation of anyone interested in community theatre, for live entertainment and a wide-range of audiences, for utilization and enhancement of the Williamsville Hall and for the generation of revenue to meet production expenses and fund professional growth and technical improvements. For more information contact Charlie Tower–contact info above –or Annie Landenberger, 802-348-7156, option 2 /verbatim@svcable.net. WILLIAMSVILLE – Rock River Players announces auditions for the October 27-30 production of A Piece of My Heart by Shirley Lauro. Auditions will be held at the Williamsville Hall on Dover Rd., Williamsville, Vermont on September 8 at 4pm,September 9 at 6pm, September 10 at 11am and September 11 at 1pm. A Piece of My Heart is a work with the music and soul of a tumultuous era in our history: The true stories of six courageous women sent to Vietnam and their struggle to make sense of a war that irrevocably changed them and of a nation that shunned them. At auditions, actors will be given pieces of the script to read according to which character they would like to audition for. After a cold reading some direction will be given and then the scene will be run again. Six women of varying ages and two men are needed: For character descriptions write director Sara Vitale at mamahospital@gmail.com or call 802-348-7156, option 2. 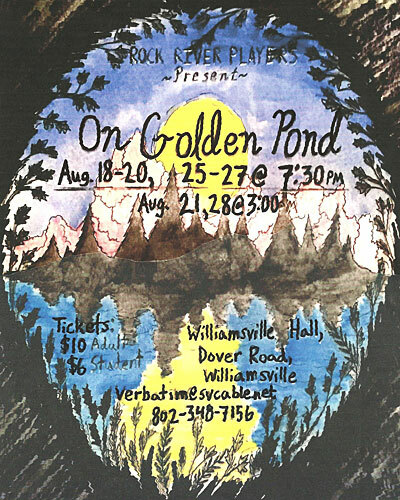 WILLIAMSVILLE – The Rock River Players present On Golden Pond by Ernest Thompson at the Williamsville Hall, diagonally across from The Eatery on Dover Road, Williamsville. 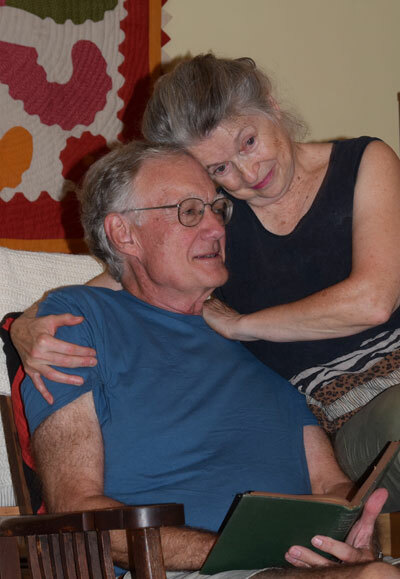 On Golden Pond is a beautiful love story—ageless and optimistic– of Ethel [Debbi Reed-Savory] and Norman Thayer [Stewart McDermet], who are returning to their summer home on Golden Pond for the forty-eighth year. A retired English professor, Norman is nearly eighty, with heart palpitations and a failing memory—but still as acerbic, sharp, and eager for life as ever. Ethel, ten years younger–and the perfect foil for Norman–delights in the little things that enrich their long life together. cast is rounded out by Miles Keefe as Charlie and Susan O’Hara as the operator. Cris Parker-Jennings directs; Rick King and Bonnie Cramp are technical staff. Annie Landenberger is producer and RRP founders are covering crew and front-of-house. Performances are Thursday, August 18 through Saturday, August 20 and Thursday, August 25 through Saturday, August 27 at 7:30PM, as well as Sunday, August 21 and 28 at 3PM. Tickets are $10 for adults and $6 for students and seniors. For more information write verbatim@svcable.net and to reserve in advance call 802-348-7156. Tickets are $10 for adults and $6 for students and seniors. The venue is Williamsville Hall on Dover Road in Williamsville. For more information write verbatim@svcable.net and to reserve in advance call 802-348-7156. 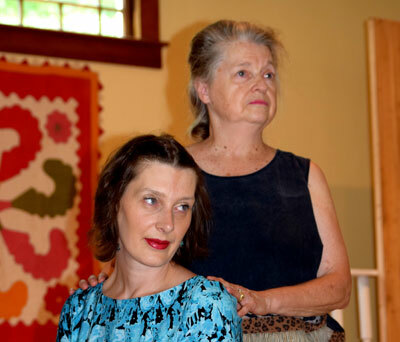 The Rock River Players launched last August with Our Town and produced You Can’t Take It With You in May. On Golden Pond celebrates the first anniversary of the Rock River Players with expansion of its pool of directors, establishment of an organizational structure, and plans for a four-production season interspersed with open readings of various plays. As the group grows, so will the need for more actors, designers, crew, committee members, producers, publicists, directors. To learn more about becoming involved, contact co-chair, Annie Landenberger, verbatim@svcable.net. For more information write to verbatim@svcable.net or call 802-348-7156. The RRP usually meet on the second Monday of each month, 6:30-8:30, at the Williamsville Hall.